Hamburg is the second largest city in Germany, after Berlin, and is home to the second largest port in Europe. Although the city was largely rebuilt after WW2, it retains strong links to it’s historic roots through the preserved history of the old town, medieval monuments, and modern museums documenting the city’s rich history. Hamburg’s airport is the fifth largest in Germany. Although there are only a few direct, intercontinental services to the airport, there are extensive connections from other European airports. 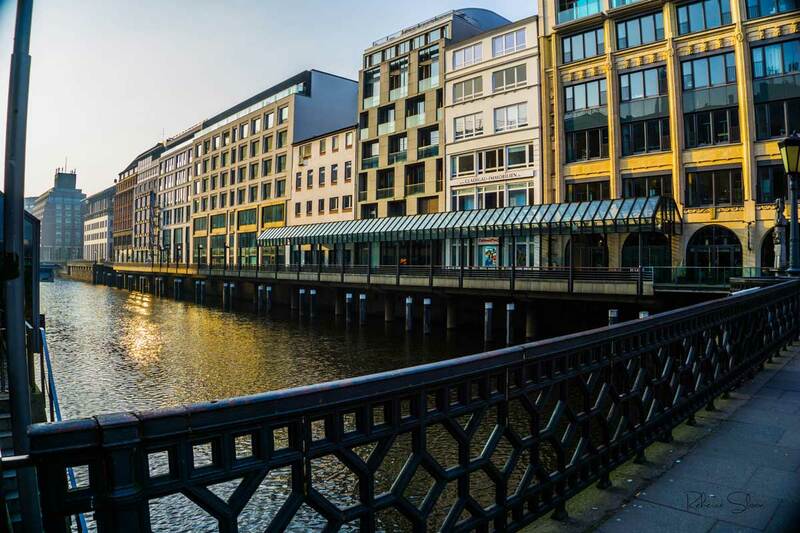 As a result, there can be some great flight deals to Hamburg when traveling to the city from within Europe. For our trip, we purchased a return ticket from Amsterdam (through British low-cost carrier EasyJet) for €50. Bargain! It was a quick, direct fly, which took just over an hour. 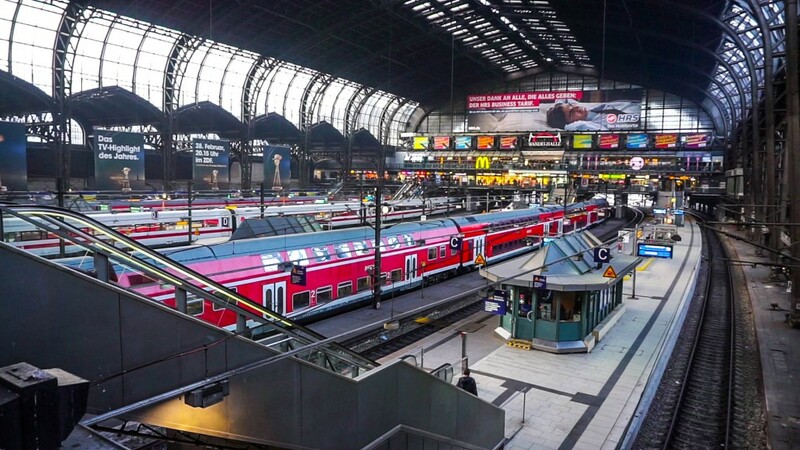 Once you arrive at the airport, the best way into the city is by catching the S1 S-Bahn metro rail network line to Hamburg Central Rail Station. A one-way journey costs €3 per person (as of February 2015) and will take about 25 minutes. Trains are frequent and run every 10 minutes or so. Inside Hamburg’s central station! It can be a little confusing to find the right entrance/exit so don’t be afraid to ask for directions if you need some help getting oriented. Although it’s also possible to get a taxi from the airport to your destination, this option will be significantly more expensive (likely costing €20- €30 in one direction, based on your destination in the city) and unless you have mobility issues or excessive baggage with you, it’s unlikely to be worth the additional cost. The train is by far the most cost-effective and efficient way to get into the town. Hamburg has an extensive, and affordable, metro system. A single ticket in the Greater Hamburg area costs €3 (as of Feb 2015), however, it’s also possible to purchase a day-ticket for up to 5 people (after 9 a.m. Monday – Friday and on all weekends and holidays) for €10.80. During our weekend break, we found the metro and metro stations to be clean and safe. 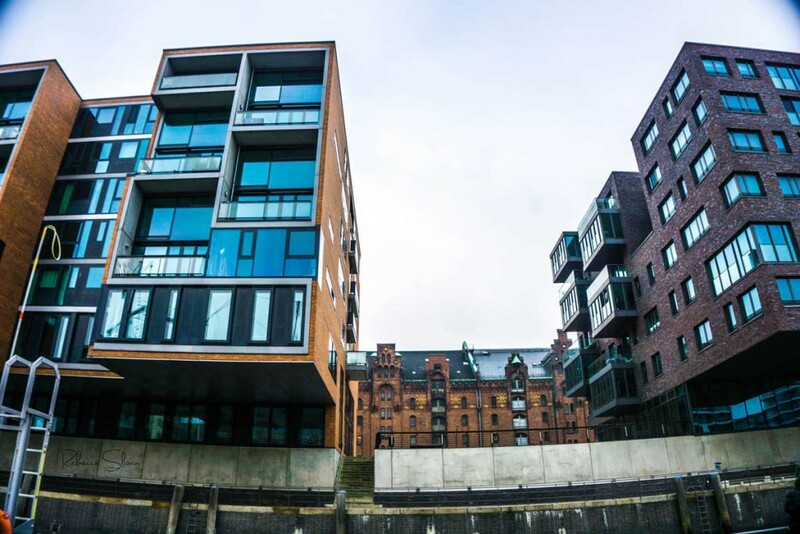 Hamburg is a large city that was largely re-built after WW2, so it’s more spread out and less walkable than many European cities that have retained their original layouts. As such, you might find that buying a day pass for the metro is the best and most economical way to get around the city. We personally enjoy walking around the city on foot and found it possible, although time consuming, to walk from place to place instead. More information on the city’s transportation system is provided by HVV. Hamburg’s Town Hall is an impressive building. The main lobby inside of Hamburg Town Hall does not disappoint. 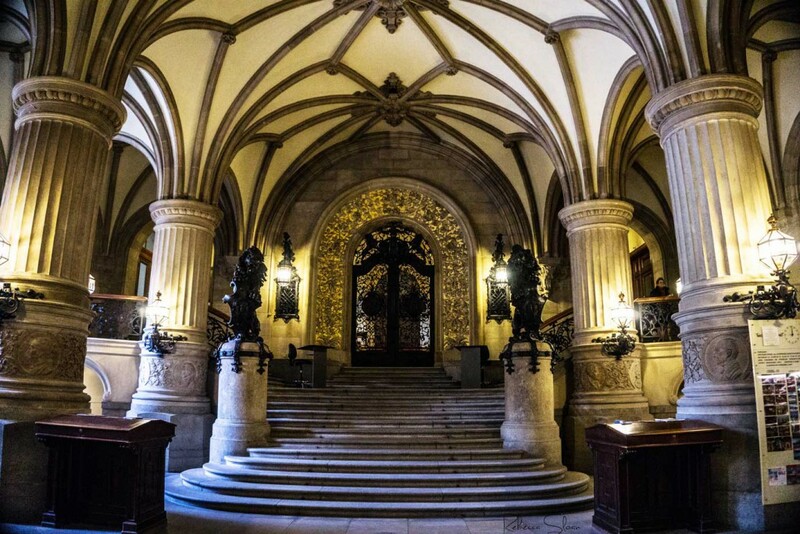 Sign up for the tour of the building for 4 euros per person – you won’t be disappointed. 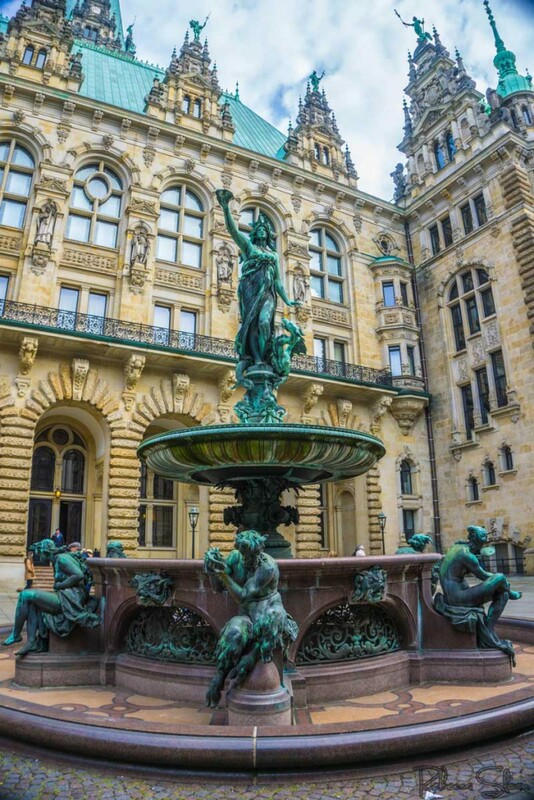 A beautiful fountain can be found in the courtyard behind Hamburg Town Hall. Entrance to the main lobby of City Hall is free and tickets to view the rest of the building via a tour can be purchased from the lobby. These tours are offered in English, German and French, throughout the day and only cost €4 per person (children under 14 are free). The only way to see the main rooms within City Hall is by taking a tour. During the tour, you’ll learn a lot about the building and the city’s political history. You’ll also get to see rooms otherwise accessible to the general public. They’re rooms still in use today and are exceptionally ornate. We really enjoyed our tour as it gave us a good overview of the city’s history and was a delight to explore. It was well worth the cost of entrance and I’d highly recommend it to you. 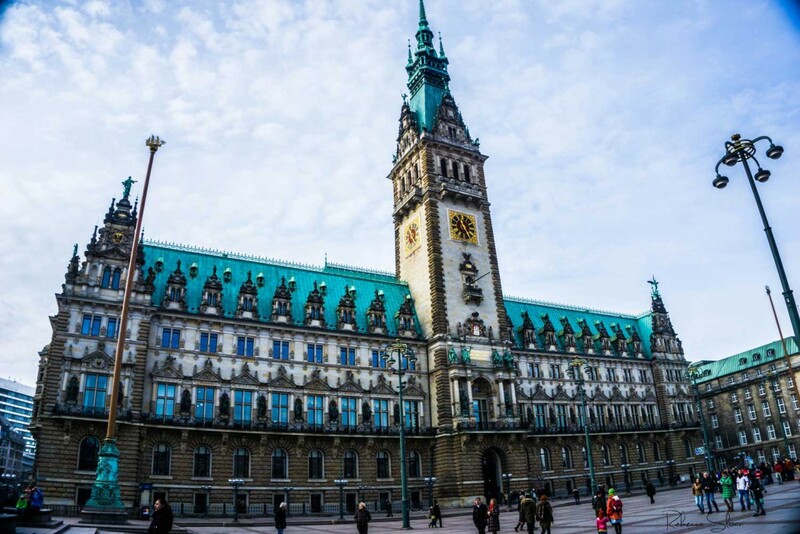 Getting to City Hall is easy if you’re already in the centre of Hamburg and it’s only a short walk from central station. 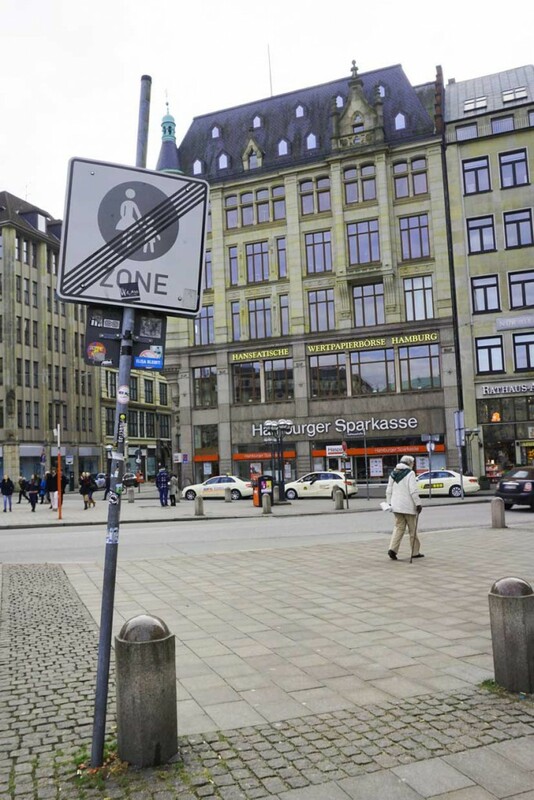 However, it can also easily be accessed by taking rapid transit to the Jungfernstieg or Rathaus (rapid transit) stops or the Rathausmarkt bus stop. If you’d like a sneak peak of Hamburg’s Town Hall, check out my video below. But for views into all the rooms, a true experience of the building, and lots of interesting information on the city though, you’ll have to take the tour! Between 1874 and 1876, this was the tallest building in the world. To date, it remains the second-tallest building in Hamburg. On site it’s possible to buy tickets to take an elevator ride to the top of the steeple for a view across the city and for access to a museum exhibit which sheds light on the steeple’s history within the city as well as into the effects of WW2 in Hamburg. Tickets to both attractions cost €5. 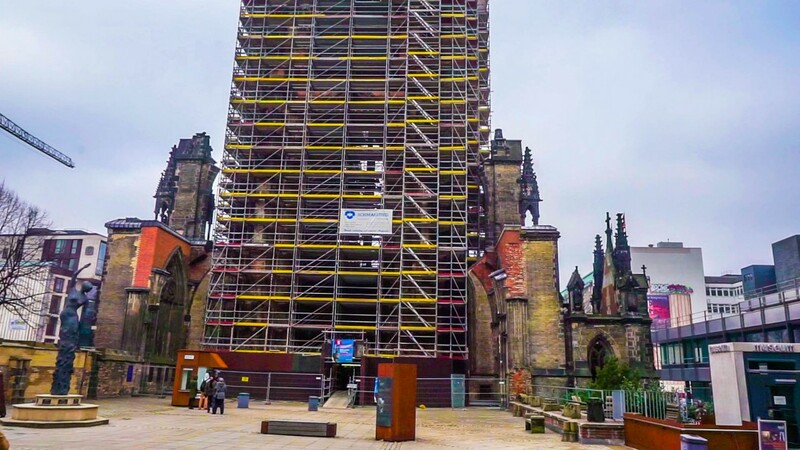 Hamburg’s St Nikolai Memorial is currently under construction as they rebuild the steeple, but you can still take an elevator to the top for a view over the city. 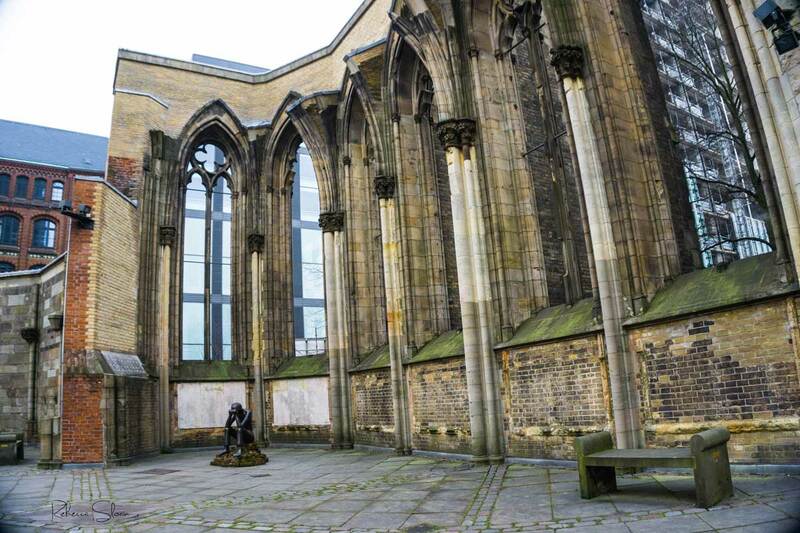 A statue of a disheartened man sits among the ruins of the St Nikolai Memorial in Hamburg. 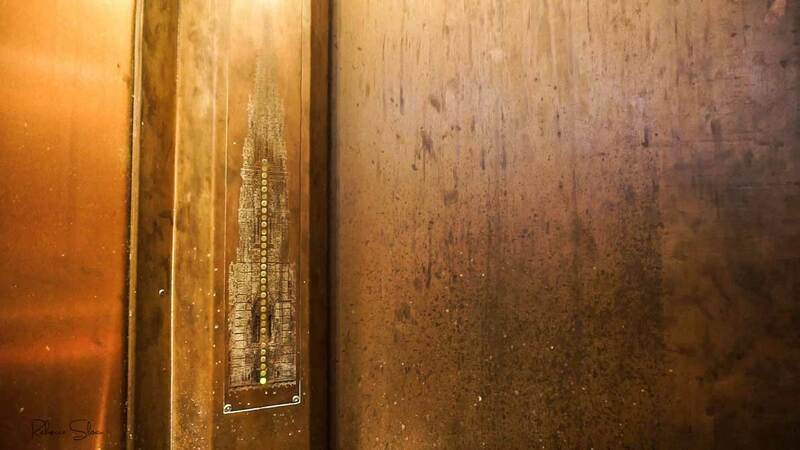 You can take an elevator all the way to the top of St Nikolai tower for a view over the city of Hamburg. And visit the underground museum located beside St Nikolai Memorial. 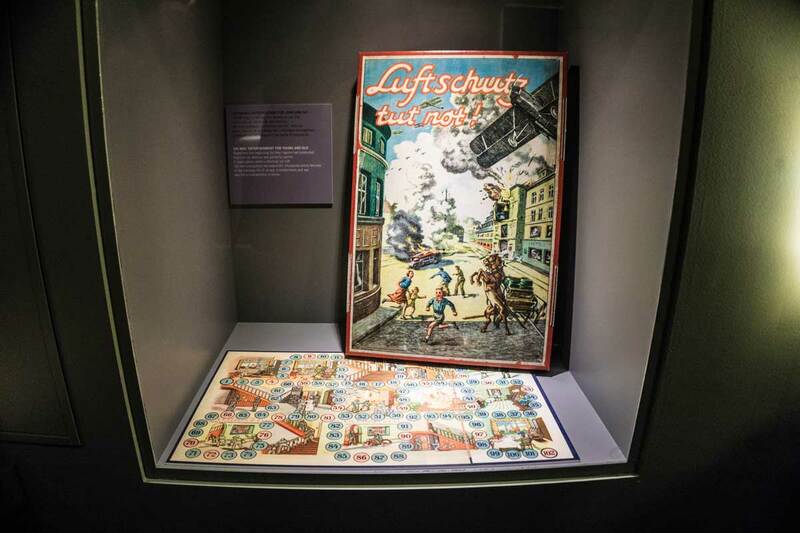 Inside you’ll see artifacts from the churchs’ past, learn about its history and also be exposed to an excellent WW2 exhibit focused on the effect of the war on the inhabitants of Hamburg. 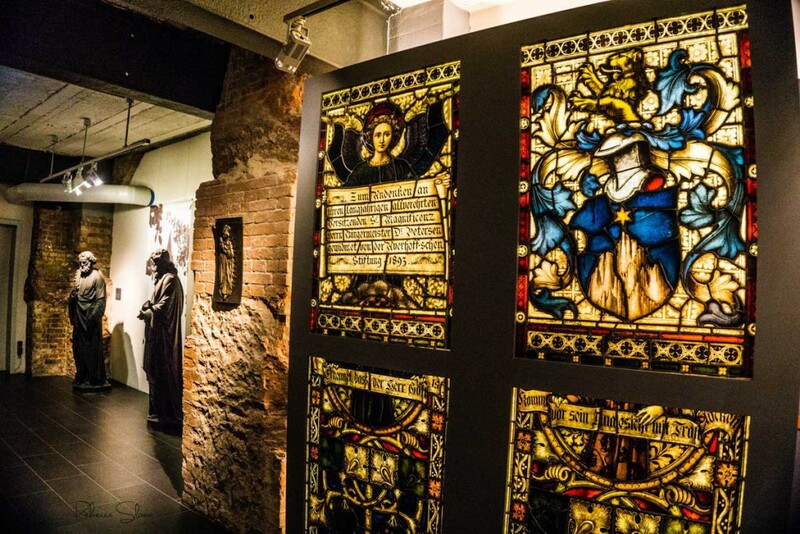 Beside St Nikolai Memorial is an underground museum dedicated to the city’s history. 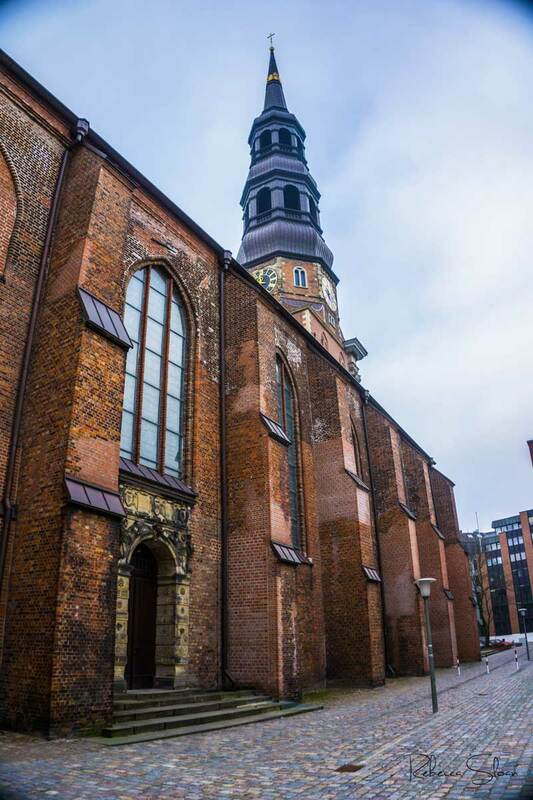 It contains information about the original church based at the site, as well as of the city’s history during WW2. This WW2 boardgame was created to help teach families what to expect and how to behave during the war. 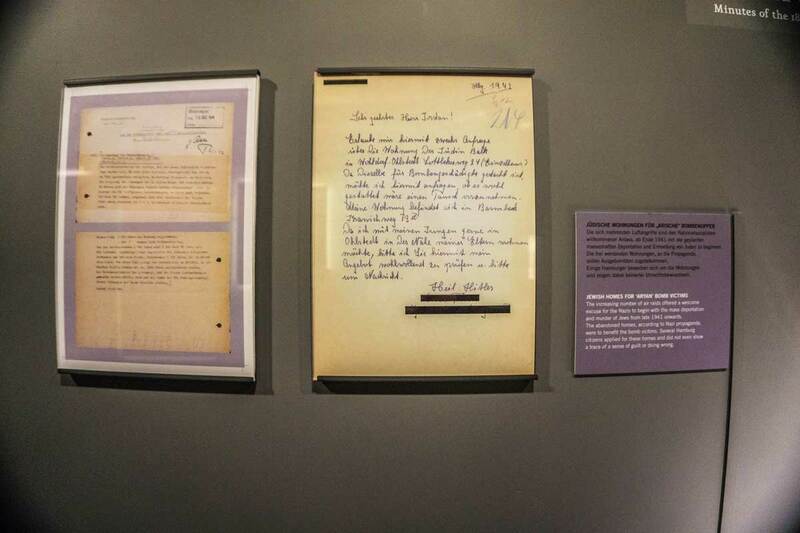 The museum has also preserved a number of letters and personal items from Hamburg residents during WW2. It provided an intimate insight into what life was like in the city at that time. Visit the Hofbrauhuis for lunch and a beer stein. The beer here is excellent and only tastes better when served in a glass the size of your head! 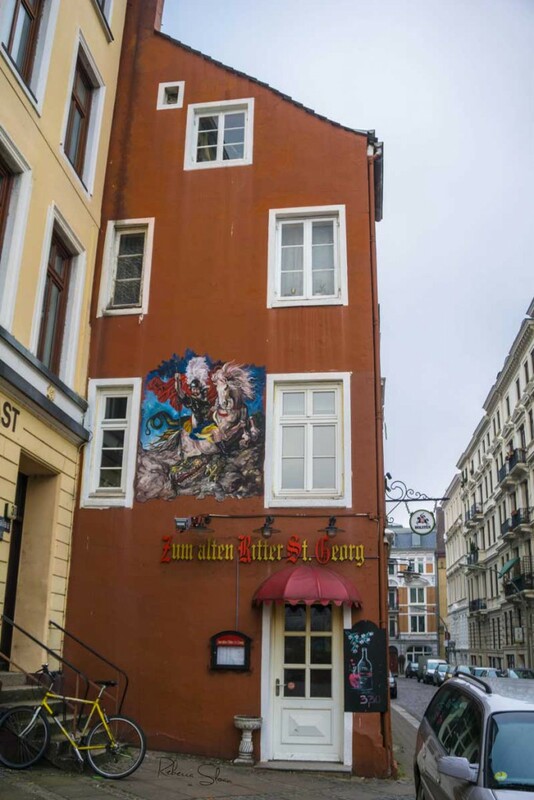 As you enjoy your beer, you’ll be able to relax in a quiet nook of the bar, watch a footy game, or simply admire the servers dressed in traditional dirndls and lederhosen. 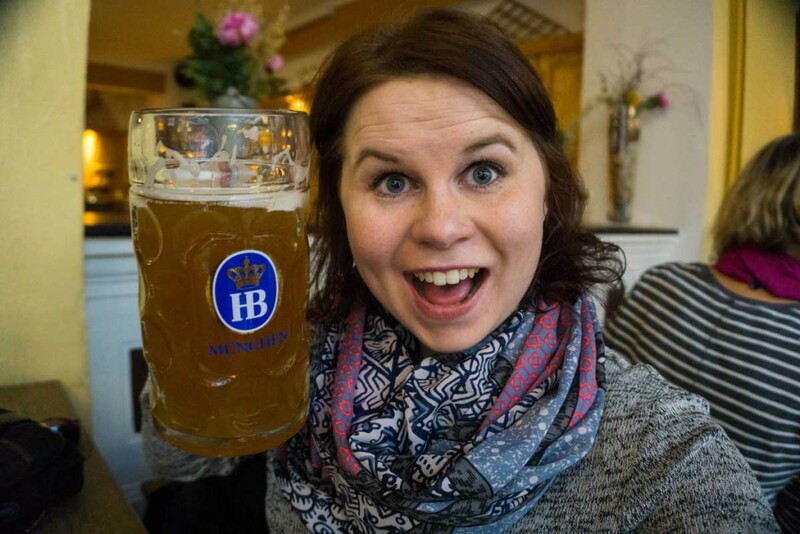 This is what a litre of beer looks like – it’s as big as my head! Thankfully this Hofbrauhaus beer tasted fantastic! Admire the boats in the harbour and docked in the old town. 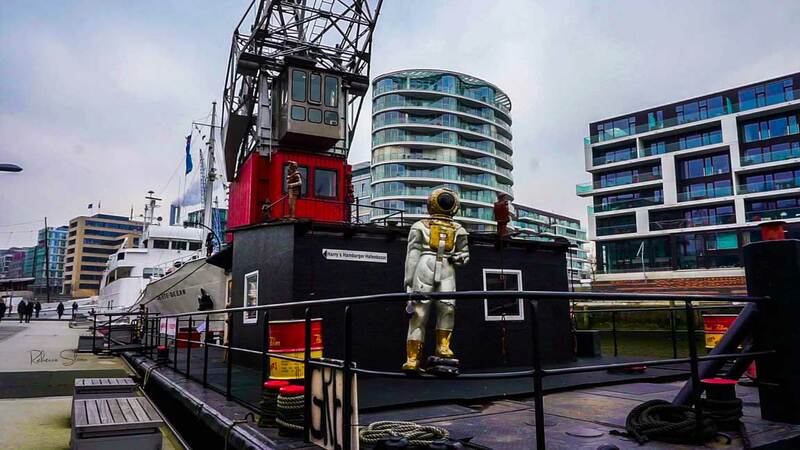 During our stroll we saw a big selection of boats, from tall ships to luxury yachts, working ships and those that have been transformed into museum exhibits. 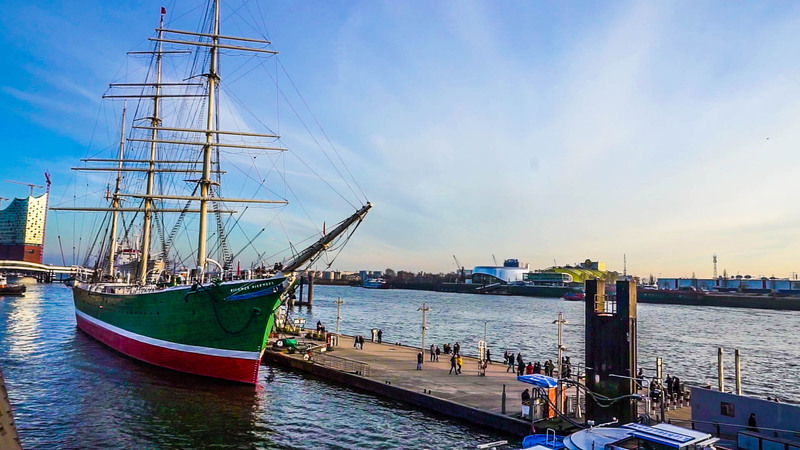 A tall-ship is docked on a pier in Hamburg. A boat museum is stationed by the docks in Hamburg’s old town. Check out all the modern statues on top of it. 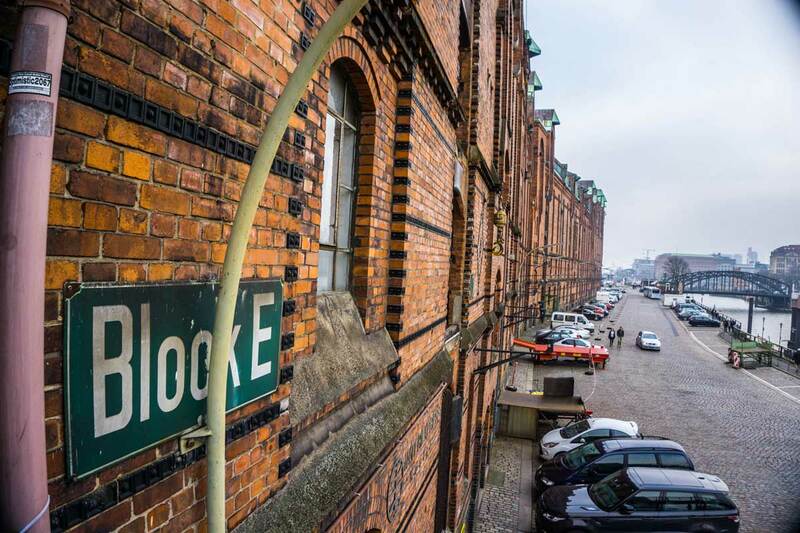 Walk through Hamburg’s Old town and admire the beautiful red brick buildings. A line of warehouses line a canal in Hamburg’s old town. The old town in Hamburg is filled with beautiful red brick buildings. These old warehouses in Hamburg’s old town have been converted into apartments. I love the look of them from the outside! In the past, I’ve never been overly impressed by the schnitzels I’ve tasted, but this one from Joh. Albrecht blew me away! 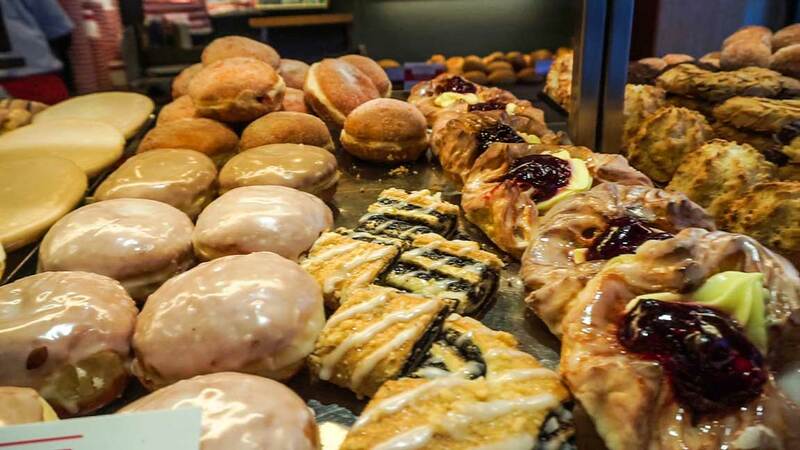 The bakeries also served a big selection of pastries I’ve never tried before – all of which were delicious. 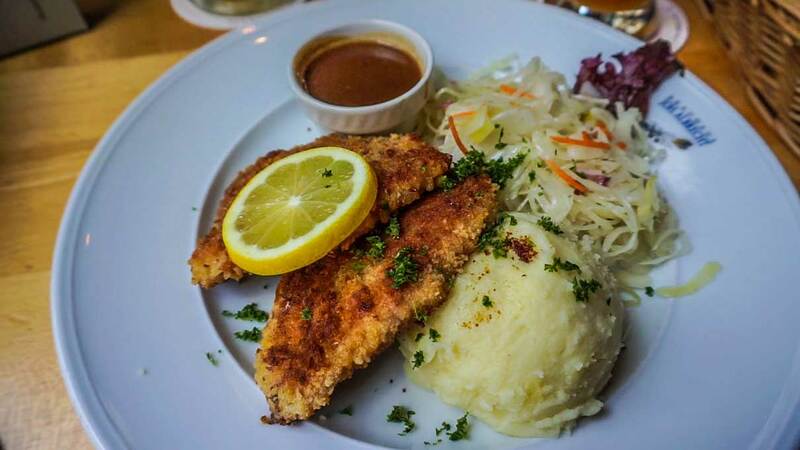 I’ve never been a huge fan of schnitzels, but after trying this one, I’ve been converted! 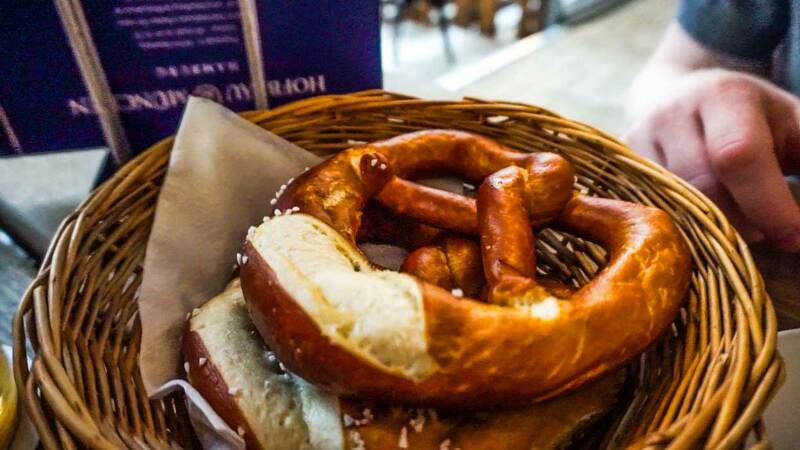 We couldn’t visit Germany without indulging in a fresh pretzel! There were so many different pastries to try at the cafes, and they all looked so good! 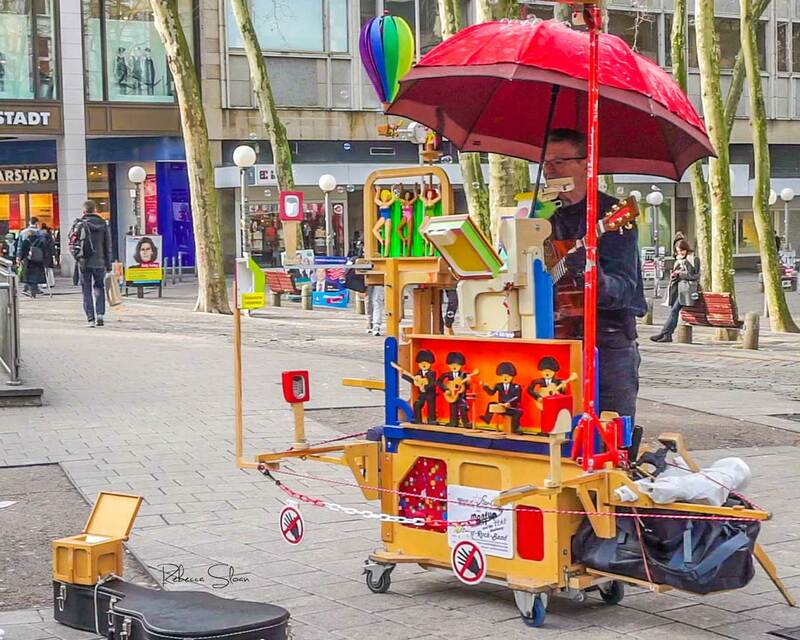 A street performer provides some good old fashioned entertainment in Hamburg. This sign seems a bit harsh. Surely we’re not banning women and children from the area? A view of a canal from a bridge in Hamburg. 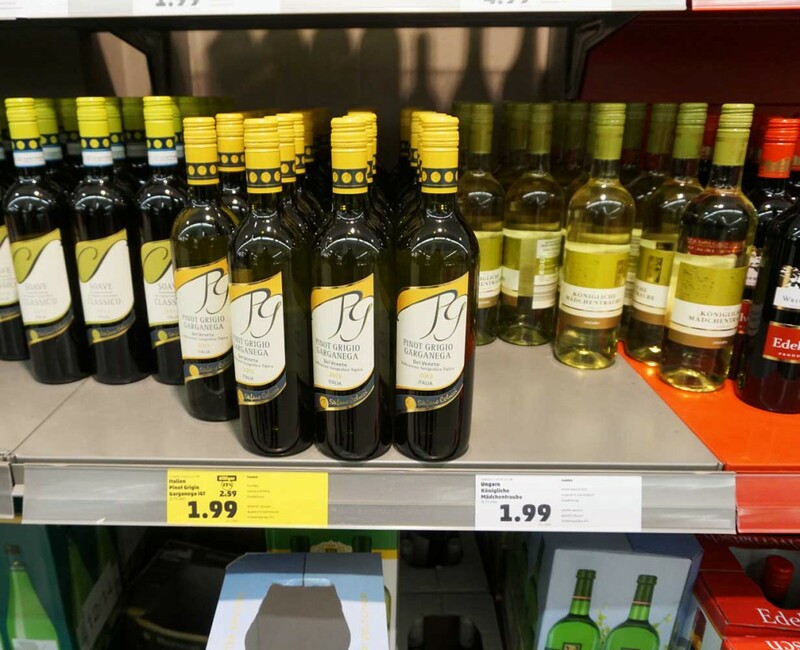 If we hadn’t stopped in a supermarket, we wouldn’t have discovered how cheap the wine and beer is to buy! Look at that price! 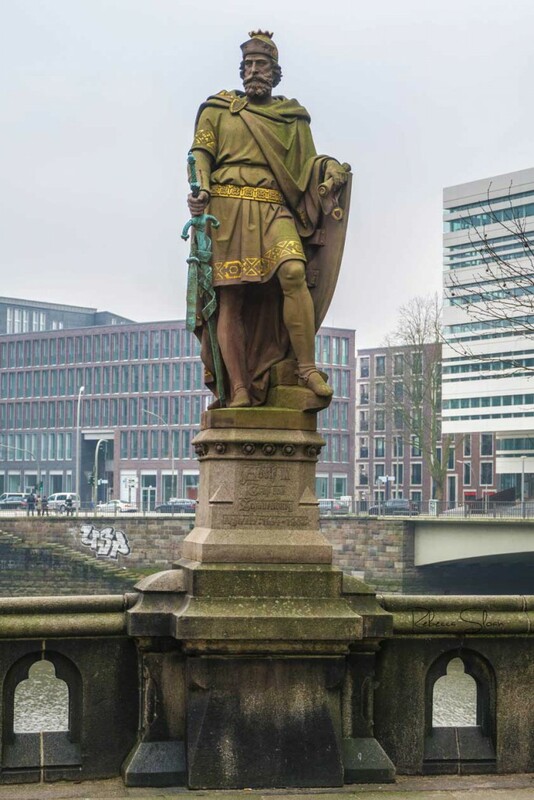 This regal statue in Hamburg can be found on a bridge close to the St Nikolai Memorial. We came across the statue, and the memorial, completely by chance. I really liked this mural on the side of a pub in a residential neighbourhood in Hamburg. 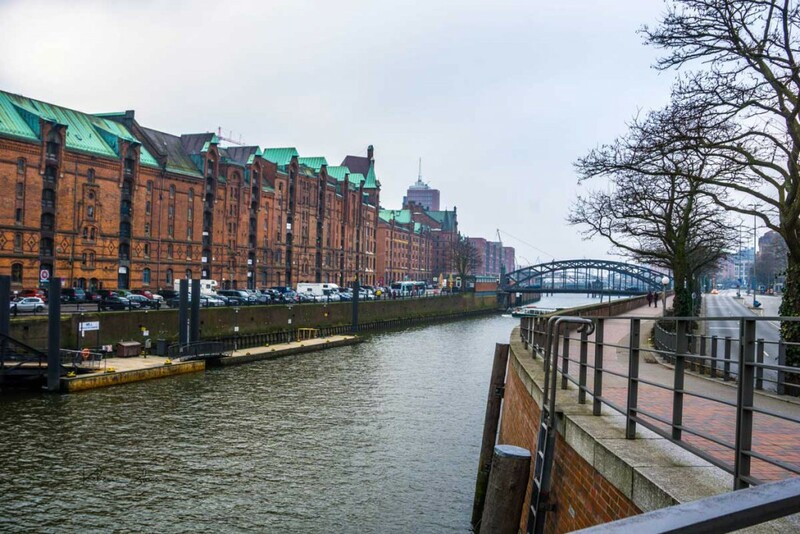 We spent about 36 hours in Hamburg, Germany and, although we didn’t see everything in the city, we felt it was about the right amount of time for us to stay. We spent most of our time simply wandering around the city, checking out the views and what the city had to offer. So our actual costs during the trip, other than our food, drink and hotel, were very low. For us it was a good, low-cost weekend getaway filled with tasty food, lots of walking and learning about the local history.